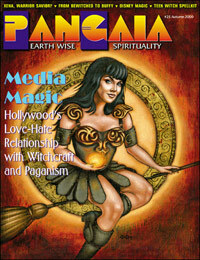 PanGaia #25 Magick in Pop Culture (original) [pg025p] - $6.95 : BBI Media - Magazines that feed your soul. PanGaia #25 - Magick in Pop Culture. From Samantha Stevens to Xena: Paganism on TV · Xena: Warrrior Savior? · It's A Magical World: Sacred Themes in Disney Animation · Witches on the Silver Screen · The Magic of Harry Potter · A Real Wizard on Harry Potter · The Art of Bowhunting · The Messenger: A Crow Named Thunder · Croaked: Pagan Fiction by Alex Beldsoe · Toe to Toe: Is the Teen Witch Kit a Sellout? · Underworld Perspective: "Celtic" a Fashion or a Tradition? · Magick in the Third Dimension: The Magic of Scent · Goddess Journeys: Native Lands of Mexico · The Gospel According to Gaia: The Religion of Gaianism · Deep Time Medicine · The Last Word · Ask Your Mama · Rental Goddess · 80 illustrated pages. Edited by Elizabeth Barrette. Autumn 2000.